Boca Raton FC won its first NPSL Sunshine Conference game with a 2-0 victory over Beaches FC in Stuart on Wednesday night. Bruno Militz and Lorenzo Cava recorded second half goals as Boca Raton downed a ten-man Beaches FC squad. The home side were reduced to ten men when Colby Burnette, a former Boca Raton FC player was sent off in minute 45 after picking up two bookings in rapid succession. After a sluggish start, both sides began to create chances about midway through the first half. The best opportunities fell to Boca Raton as the tempo of the match quickened. Militz just missed the target in minute 27 and four minutes later Shadi Harb hit the crossbar. In minute 35, Militz had a free kick from a dangerous area hit the wall. Throughout the first half, Militz, the Boca Raton FC Captain was dangerous, finding pockets of space behind the Beaches FC defense and making dangerous diagonal runs. Beaches FC goalkeeper Elliot Barker was called into action repeatedly in the first half but rose to the occasion as did defender Callum Chapman-Paige was both solid in defense and comfortable on the ball in starting Beaches FC’s buildup play. Beaches best first half opportunity came in minute 41 when striker Jordan Hall sent a dangerous free kick just over the far post. Despite being reduced to ten men, Beaches FC had much of the ball the first seven minutes of the second half but then Militz beat the backline on a counter attack which was scored against the run of play. The fifty third minute goal allowed Boca Raton to play with more freedom for the remainder of the game. 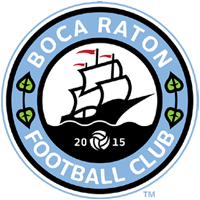 Beaches FC had a few chances to equalize but Cava put the match away with an 87th minute goal to seal all three points for Boca Raton. These same two sides will face off next Wednesday at the Shipyard in Delray Beach. Game time is set for 7pm ET. Beaches FC host Kraze United this Sunday while Boca Raton FC will be off from NPSL action this weekend.